Issues around America’s free-roaming horses that inhabit the western rangelands tend to be presented through a “politicized lens”, a review suggests. Solutions to reduce herd sizes faced issues of ethics and perception, according to the report published in The Professional Animal Scientist. The Mississippi State University review team cited more than 40 papers in their examination of what they characterized as the challenges and opportunities in the rising horse population on the rangelands. The Wild and Free-Roaming Horses and Burros Act of 1971 was established to resolve conflicting beliefs around the horses, and has been described as the driving force for educational programs associated with this management, the review team noted. “Because most US citizens have little or no direct relationship with the feral horse problem, they are dependent on information provided by other sources such as the Bureau of Land Management (BLM) along with lobbying groups and so on, thus, creating a ‘politicized lens’ through which feral horse issues are viewed. “Nevertheless, with the recent concern over unwanted horse numbers in the US becoming front and center in US politics, the plight of the feral horse has also become publicly acknowledged. This, they said, had highlighted the need for education, further study, and resolution. Horses that roam the rangelands are free-ranging descendants of once-domesticated horses. In 2015, the number of feral horses in the US western ranges was estimated at 58,150. With few natural predators, populations would continue to rise, with the potential to double every four years. “The ever-expanding population of feral horses is a critical but not simple problem to solve,” Ward and her colleagues wrote. “Understanding the nature of the feral horse is a crucial part of the solution process. In the 1950s, to combat rising populations, many feral horses were slaughtered by various means, including by poisoning watering holes. This solution was met with public outrage and led to Congress passing the Wild Free Roaming Horse and Burro Act of 1971, which protected feral horses as a link to the country’s national heritage. The act protected horses on federal land and kept them from slaughter, prompting new efforts at population control. Since that time, the BLM has paid to keep captured horses in grazing allotments, where they can be managed and adopted-out. Many horses do not get adopted, however; likewise, the process of rounding-up feral horses is expensive and accumulated costs to maintain captive feral horses are estimated to exceed $US1 billion by 2030. Such rising costs may end the adoption practice in coming years, according to the BLM. Excessive population density can pose an issue for vegetation health, herd health, and the indigenous population’s health, the review said. “In the past, animals in overpopulated areas were herded into groups for removal from BLM managed areas every three to five years. Currently, managers are still working to control the herd size and manage the population through sales, adoption programs, and fertility control methods. The practice was controversial, as animal welfare activists often did not agree with the use of contraceptives, but the United States Humane Society was in support of such measures. Contraceptives, such as porcine zona pellucida vaccine, castration, or vasectomy, have not been without side effects. However, these methods may only slow growth, or in the case of vasectomy have no effect on foal rates; likewise, they may disrupt seasonal patterns within the herds among other changes. The reviewers noted that, since 1971, 270,000 horses had been removed from public lands. Posing the question, “Is there a solution,” the review team observed: “The feral horse population is respected for its historical significance in the exploration of North America and the US, triggering emotional responses at any discussion of controlling this population. “Politicians have to balance these emotions with financial considerations to find a solution. “Nevertheless, determining the most effective management practices requires knowledge of the politics of the public as well as the horse population dynamics. They said that while contraceptive vaccines appeared to be an acceptable solution for all groups concerned with the run-away population, there were still further questions concerning their long-term effectiveness that would need to be addressed through further investigation and study. “Review: Challenges and opportunities in rising feral horse populations,” by J. L. Ward, S. Lindsey, J. M. Martin, M. Nicodemus, and E. Memili (doi:10.15232/pas.2015-01415) appears in The Professional Animal Scientist, volume 32, issue 6 (December 2016), published by Elsevier. Horse Slaughter supporters refer to them as Feral. Incorrect terminology. They jave Absolutely No evidence to back up the claim. There is a slant Against wild horses in this article referencing horses as feral without factual verified evidence. The feral horses are not mating out of control. In fact the roundups are a rouse to mislead the public and demand killing them by saying overpopulated or unwanted all terms coined by pro horse slaughter. If your writing articles make sure you have evidemce which you do not. The Big Lie of “overpopulation” is the pretext for BLM’s war against the wild horses. It’s BLM’s version of the “Shock Doctrine,” wherein BLM concocted a phony crisis to push through policies antithetical to the Wild Horse Act against the will of The People. In fact, horses are a slow-growth species when it comes to reproduction. The gestation-period lasts over 11 months, and a mare produces just 1 foal. While an independent study of BLM’s records did confirm a nearly 20% birth rate, that study also found that 50% of foals perish before their first birthday. Thus, the effective increase in population from new foals is just 10%. However, adult mortality must also be taken into consideration. Adult mustangs succumb at a rate of at least 5% a year. So, what is a normal herd-growth rate? Around 5%, probably less. Thus, a herd could not double in 4 or 5 years, debunking another BLM falsehood. But BLM stealthily inserts herd-growth rates far higher than 20% in its reports — biologically-impossible herd-growth rates. For instance, in Wyoming, BLM declared that the Salt Wells Creek herd grew from 29 horses to 616 horses in 6 months (yes, months), a 2,024% increase. BLM’s “data” is chock-full of preposterous growth-estimates. So, when you hear talk of how the wild horses are reproducing “exponentially,” that’s a sure sign that BLM has falsified the data. You should also know that the National Academy of Sciences was required by the terms of its grant to draw conclusions per BLM’s figures — the falsified figures. The NAS was not allowed to collect data independently. Thus, BLM wired the results to confirm its lies. Wild horses are underpopulated. Per the guidelines of BLM’s own geneticist, more than 80% of the herds suffer from arbitrary management levels (AMLs) set below minimum-viable population (MVP). Low AMLs enable BLM to claim an “excess” in herds whose numbers, even if they were over AML, would still not reach MVP. So being “over AML” is meaningless as well as misleading. But those low AMLs, combined with fraudulent, biologically-impossible herd-growth estimates, give BLM an excuse to scapegoat those few wild horses for the range-damage done by the millions of livestock that overgraze the public lands. 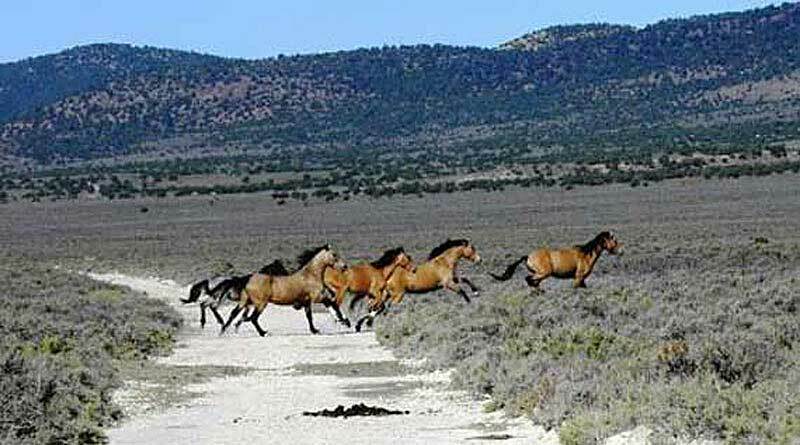 PZP is a potent weapon in BLM’s arsenal — for its biological warfare against the wild horses. PZP is a registered pesticide. Its mechanism-of-action is to cause auto-immune disease — tricking the immune system into producing antibodies that target and attack the ovaries. The antibodies cause ovarian dystrophy, oophoritis (inflammation of the ovaries), ovarian cysts, destruction of oocytes in growing follicles, and depletion of resting follicles. The mare’s estrogen-levels drop markedly as PZP destroys her ovaries. Ultimately, PZP sterilizes her. A recent study — which included the McCullough Peaks herd — found that PZP extends the birthing season to nearly year-round. Out-of-season births put the life of the foals and the mares at risk. Worse yet, radioimmunoassay tests indicated that PZP antibodies are transferred from mother to female offspring via the placenta and milk. As for the wild horses held in captivity, they are the “legacy” of former Secretary Salazar’s equid cleansing era, during which he had tens of thousands of wild horses removed from the range. However, the mortality rate of captive wild horses is about 8% a year. So, obviously, since they are not reproducing, their numbers will steadily drop, showing that BLM’s billion-dollar figure for their care was bogus — it was just another Lie. But that Lie has ballooned. BLM has taken the $1 billion figure that it originally announced, multiplied it by 230%, and then multiplied that number by another 200%, amplifying the fraud. When BLM lies, it lies Big. The Wild Horse and Burro program, if administered per the minimum-feasible management-model specified by Law, would not cost much at all. BLM does not lack for resources. There are 22 million acres of legally-designated wild-horse herd areas — which BLM previously took away for political expediency — that can be reopened as habitat. The horses now held captive can be released to those areas, where the cost of their upkeep will be $0. Contrary to BLM’s disinformation campaign, wild horses do have natural predators — mountain lions, bears, wolves, and coyotes. But those predators are persecuted mercilessly. The government exterminates what the hunters don’t shoot. However, the International Society for the Protection of Mustangs and Burros — Wild Horse Annie’s foundation — notes that even without predators, their wild-horse herds self-regulate their numbers, with population-growth in the single digits. Finally, adoptions have not declined. It’s just that BLM used to count sales-for-slaughter as “adoptions.” Now, only “forever-family” placements qualify. However, mustangs are not homeless horses. They are wild horses whose home is on the range.